"These biscuits are moist and crumbly and rich. Their delicate texture comes from the lack of handling and the wetness of the dough." Preheat oven to 425 degrees F (220 degrees C). Lightly grease one baking sheet. In a large bowl, mix together flour, sugar and salt. Cut in shortening until mixture resembles coarse meal. Stir in cream and buttermilk until dough resembles cottage cheese. Generously sprinkle a smooth surface with flour. Spoon out batter into four lumps spaced well apart on the floured surface. Flour the top of the dough and your hands. Turn dough balls in the flour, shake off excess flour and place on prepared pan. Bake in preheated oven for 20 to 25 minutes, or until lightly browned. Remove from oven, brush with melted butter and serve. 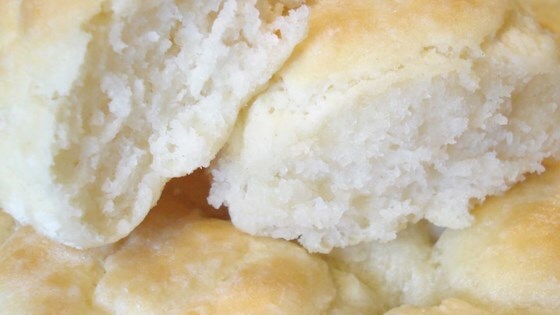 See how to make beautiful, flaky-but-tender buttermilk biscuits. I guess the one person who didn't like these biscuits scared everyone from trying them. I think the recipe is great. I LOVE THIS RECEIPE I NOW MAKE IT QUIT OFTEN!!!! !